Fair Haven, New York - The steamship Bay State has been discovered in the deep depths off the southern shore of Lake Ontario near Fair Haven, NY. Shipwreck explorers, Jim Kennard and Roger Pawlowski located the shipwrecked steamer Bay State utilizing a high resolution side scan sonar system. The Bay State is the oldest propeller driven steamship found to date in Lake Ontario. It was nearly midnight on November 4, 1862, when the steamship Bay State departed Oswego, New York with a full cargo of general merchandise for Cleveland and Toledo. Within a few hours the winds coming from the west increased to gale force preventing the steamer from making headway to the Welland Canal and beyond to the ports in Lake Erie. On board the Bay State were between sixteen to eighteen persons, seven passengers along with officers and crew. There were no records kept of the crew so the exact number is not known. Based on the pieces of wreckage found on the floor of the lake, it appears that Captain Marshall had turned the Bay State around and was heading back to Oswego. This was the beginning of the end as the Bay State was starting to come apart depositing parts of the ship on the bottom of the lake. Within another quarter mile the steamship foundered. The wreckage and merchandise on board the ship washed ashore near the town of Oswego. Cart loads of these goods were gathered up by eager residents and quickly carried away. The life-boat and many papers from the steamer came ashore about three miles west of the city. Unfortunately none of the passengers or crew survived this terrible marine disaster. Captain Marshall and four of the crew had been residents of Oswego. The Bay State was built in Buffalo, New York in 1852 by shipbuilders Bidwell & Banta. Previously owned by the Northern Transportation Company the steamship was acquired in 1861 by Chamberlain & Crawford of Cleveland, Ohio. As indicated on the enrollment papers, the steamship was a wooden ship and had a length of 137 feet with a beam of 26 feet, two decks and a single mast. The Bay State was one of the early propeller driven steamships on the Great Lakes. Prior to 1841 steamships on the lakes were driven by paddlewheels. 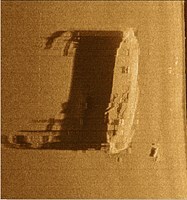 While searching for shipwrecks in Lake Ontario in late August 2015 the sonar return of the lake bottom spiked up on the boat depth finder just before an image of a shipwreck appeared on the display of the side scan sonar system. We had run right over the top of a wreck resting on the bottom of the lake. Using the DeepVision side scan sonar the wreck was then surveyed from several different viewpoints to determine its size and shape to aid in identification. The area around the wreck site was also surveyed and it was determined that for almost a quarter of a mile this ship was coming apart leaving debris in its wake before eventually sinking to the bottom of the lake. The wreck was found in deep water beyond the safe limits for exploration by recreational SCUBA divers. 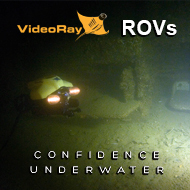 A VideoRay Pro IV remote operated vehicle (ROV) was used to view the shipwreck. The ROV is capable of descending to a depth of 1000 feet and has a low resolution video camera and on board lights. At a depth of over several hundred feet there is no natural light to illuminate the bottom. Control and power is provided via a tether attached to the ROV from its control system on board the boat. The ROV was deployed and landed within 10 yards of the wreck. 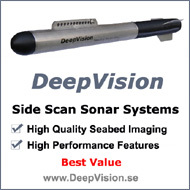 The onboard sector scanning sonar guided the ROV to the starboard side of the shipwreck about mid-ship. Hanging haphazardly over the wreck were large pieces of railing or framing. The ROV moved past these pieces and found a clear area on the deck to set down where it was able to make a complete scan of the shipwreck to determine shape and size. In the distance a winch could be seen. The entire top structure of the shipwreck was missing. Only the remains of a rail or what may have been framing are left standing mainly in the bow and stern while other portions are lying on the deck of the shipwreck. The ROV then descended back to the lake floor and on to the bow of the ship. Two anchors were observed still hanging from the starboard and port hawsers. As the ROV was moved from the bow to the stern of the ship something was preventing any further movement. Extending out from the wreck a piece of debris had snagged the tether of the ROV on a long sliver of wood. The next several hours were spent trying to release the ROV from its entanglement until the power from the battery for the ROV ran out. Due to inclement weather in September and lack of availability of technical divers to make a deep dive, nearly a month went by before the ROV would be recovered. Typically the name painted on the side of a ship does not survive over a long period of time underwater. Identification of the shipwreck was based on several factors including size, shape, type, location, and conditions causing the wreck. The technical divers reported viewing the propeller and a large opening on the port side of the ship for loading cargo. An article on the loss of the steamship Bay State in the Oswego Commercial Times newspaper from November 4, 1862 provides some information of the ship disaster. Kennard has created a detailed shipwreck database of over 600 ships that have sunk or been wrecked on Lake Ontario over the past 350 years. The only propeller driven steamship lost in the area off Fair Haven, New York of the exact same size is the Bay State. The debris trail west of the wreck site provides another clue that the steamship had turned around due to high winds from the west in an attempt to make it back to Oswego. A review of other steamships lost in Lake Ontario, confirms that the Bay State is the oldest propeller driven steamship found. There are estimated to have been between 6000 to 8000 ships that wrecked in the Great Lakes with over 600 occurring on Lake Ontario. Many of these ships were wrecked or burned in a harbor or were driven on-shore where they were pounded to pieces. Today there are over 200 ships that still remain in the lake. In recent years there have been several notable shipwreck discoveries off the southern shore of Lake Ontario. The lake depths often exceed several hundred feet just a few miles from the southern shoreline. Shipwrecks that are located in these depths are beyond the range of recreational divers and require expensive search and support ship equipment to find them. The steamer Bay State is one of these ships. It is a significant discovery being the oldest propeller driven steamship discovered in Lake Ontario. 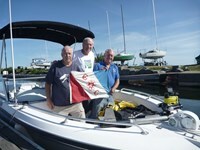 Jim Kennard has been diving and exploring the lakes in the northeast since 1970. He has found over 200 shipwrecks in the Great Lakes, Lake Champlain, NY Finger Lakes and in the Mississippi and Ohio Rivers over the past 40 years. In 1983 he discovered a unique horse powered ferryboat in Lake Champlain. National Geographic featured the ferryboat in their October 1989 issue. 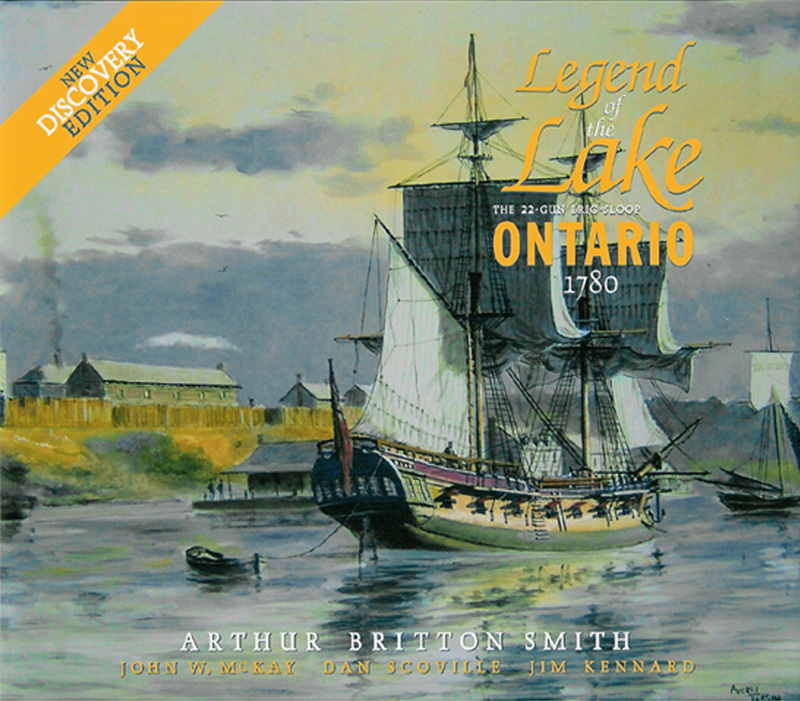 In May 2008 Jim Kennard and Dan Scoville discovered the 235 year old British warship HMS Ontario, the oldest shipwreck ever found in the Great Lakes. Kennard is a Fellow member of The Explorers Club. Roger Pawlowski has been diving on shipwrecks in the northeast and Pacific for the past 14 years. He is a retired Air Force Reserve pilot and flew missions in Desert Storm. In 1980 while flying a practice mission over Lake Ontario he witnessed a small aircraft plunge into the lake. His details of the incident and location helped Kennard locate the aircraft which was several miles from shore and in over 100 feet underwater. Pawlowski is an electrical engineer and runs his own engineering consulting business. Roland ‘Chip’ Stevens is a retired architect and working artist whose watercolors, many of which have been accepted into national exhibitions, are well known in the Rochester area. A sailor for over 60 years, Stevens has a love of the sea as reflected in his seascapes. A number of his paintings of shipwrecks discovered by the team have appeared in news stories and publications. Based on the ROV video recording and side scan sonar imaging, Stevens created a watercolor painting of the steamship Bay State as it appears today on the bottom of Lake Ontario. I loved reading about the Rove and how it works. Stories abou the sea have always interested me. You just have to publish a book on the wrecks you have found. Pics included. Please?